Energy Drink Forces Politricks to Stop Sleepin? This new energy drink, ‘Cocaine’ is coming under fire from parents and politicians, concerned it sends a strange message to children [wow…wonder why?]. Now, we here at MNP are all about your freedoms, and feel that in your leisure time you should be able to do you, even if your life resembles a certain Grandmaster Flash song. 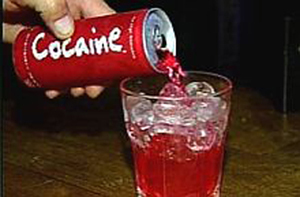 That being said…Cocaine, the energy drink? These people wanted the exposure. I actually wasn’t sure about posting this, because it was part of their plan people – dupe us into talking about their product so they get free advertising [speaking of shameless product placement…have you printed up any MNP flyers yet?]. Its claim to fame here [outside of the name] is that it packs 280 milligrams of caffeine in 8.4 ounces….meanwhile an ‘acute overdose on caffeine’ is just anything over 250 milligrams [thanks wikipedia], or roughly 3 cups of coffee in a row. So now politicians want them to pull the product or change the name…and some stores have stopped selling it. Point is tho, do we really need another energy drink? I mean, I’ve watched people pound Redbull right after telling me how bad my 3 cups of coffee a day are for me. Point is tho, who cares? These fools are gonna make millions of dollars in the end cuz they chose a ridiculous name that they knew damn well would start ish [you know a bunch of people were sitting around a table talking about this before the product launch, and it was originally called something like Flash or Shock].